Bottomless is an apt title for Dan Lee’s multifarious study of addiction, redemption, and the ever-present schisms that echo from the past. Its sharply crafted and occasionally brilliant dialogue underscores a narrative grappling with cultural and emotional complexities of unplumbed depth. With little more than a brisk hour to explore them, however, it’s also a play that feels frustratingly unmoored to any solid conclusions. Will (Mark Wilson) has come to Broome with a plan. Claudia (Margaret Harvey) has met men with plans before. As the manager of the town’s Sober Up Centre, she has been sent plenty of cocksure outsiders, just like Will, convinced their newfangled strategies will save Broome from its alcoholism crisis. They think they know the place and its people; the things that drive them, the hurts that control them. They rarely stick around for long, especially when the wet season is about to break, bringing with it an elemental force that no amount of pop psychology or intellectual pretentions can tame. Opposite the Sober Up Centre, the walls of Broome Prison bear a telling paradox. Signs warn off attempts to break in, while those inside wish to break out. Similarly, those who blow under .15 on the breathalyser are denied a bed at the Sober Up Centre, compelling them to break into the prison of their addiction to access the place intended to free them. Will sees this vacillating cycle and recognises it immediately. He has lived it firsthand and knows the only way to break it is to find ‘the liminal moment’, that hinterland between the in and out, recovery and relapse. Claudia scoffs at this philosophy and Will’s implacable confidence; her viewpoint on addiction, and the lasting impact it has had on both her family and her culture, gaze through an altogether more poignant lens. Despite its fleet-footed running time, Lee’s densely layered text gives the audience a great deal to consider, on both macro and micro levels. At its core, Bottomless seems to be a play about perception and how the warped subjectivity of addiction can metastasise, producing its own realities. This is the play’s broadest premise, but it is in the finer detail that this production really excels. Lee’s skill with tone and language is at times thrillingly potent, and by turns as comically incisive as it is poetic. Director Iain Sinclair makes deft use of the generous space at fortyfivedownstairs, cleverly utilising Romaine Harper’s minimal yet versatile set – a simple pair of chain-link gates – to toy with the narrative’s exploration of imprisonment and freedom. There are some terrific performances too. Mark Wilson brings razor sharp intensity to Will, rather appropriately toeing the line between enthusiasm and mania, while Mark Coles Smith, as Claudia’s alcoholic brother Jason, manages to find a convincing characterisation without losing any of the gravity of Lee’s rich dialogue. Margaret Harvey’s Claudia is the still point of this turning world, bringing an anchoring consistency to an often shifting theatrical landscape. 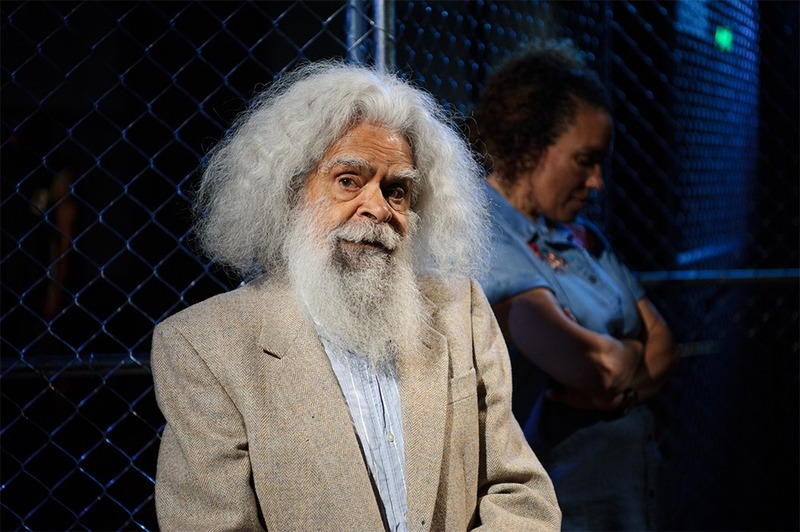 While, in some respects, his rather brief role seems to underutilise him, the magnificent Jack Charles delivers some much-needed pathos in what is otherwise a rather emotionally arid show. However, for a play that muses on perception, Bottomless suffers from an ironic number of conceptual red herrings. The most derailing is the significance of this play’s cultural make-up. Will’s arrival in Broome as an outsider, whose mission is to rescue, albeit not exclusively so, First Nations characters, appears to position Bottomless as a twist on the 'white saviour' narrative, summoning the irreconciled trauma of colonial invasion. Yet later in the work, as the boundaries of Will’s perception begin to crumble, a parallel plot about the death of Claudia’s brother in a hit and run makes glancing implications that, while never confirmed, leave us questioning Will’s true stake in the matter. The audience is also left to wonder whose reality we’ve been witnessing, and if the universe of the play exists in just one character’s subjective experience, or several. As it turns out, the one experience the audience might benefit from knowing is Lee’s. Much of Will draws on the playwright’s (publicly acknowledged) struggle with alcohol addiction. While it could be argued that such preamble shouldn’t be a prerequisite for theatrical success, it does clear up some of the story’s vaguer moments. It is hard to say if knowing this profoundly personal subtext makes the play’s lack of emotional substance more or less problematic. Is it reasonable to challenge Lee for not sentimentalising what are no doubt bleak experiences, even if this does rob the audience of an opportunity to connect with his characters more meaningfully? While some corners of the narrative suffer from ambiguity, others prove overladen with meaning. Bottomless has been several years in the making, having passed through various periods of development since winning the R.E. Ross Trust Award in 2014, including readings at Melbourne Theatre Company, Red Stitch Actors’ Theatre, and the venue of this, its première season, fortyfivedownstairs. With such a long gestation, I doubt any corner of this text hasn’t been thoroughly considered. Indeed, if anything, there are moments when the material feels over-thought. Certain repetitive allegories – the image of an ant reaching for the sky; the duality of the infinite and infinitesimal; the subtleties of perception and reality – are at times so heavy-handed that they overwhelm the simple pleasure of the storytelling, weighing it down with its intellectual heft. This might be more an issue of duration than of substance. There is an epic quality to this short play that is crying out for more space. Given the time to explore all its possibilities, to unpack and realise its full ambition, Bottomless could be an astonishing piece of contemporary storytelling. From this little thing a big thing should grow. First published 4 Mar 2018, for Australian Book Review.